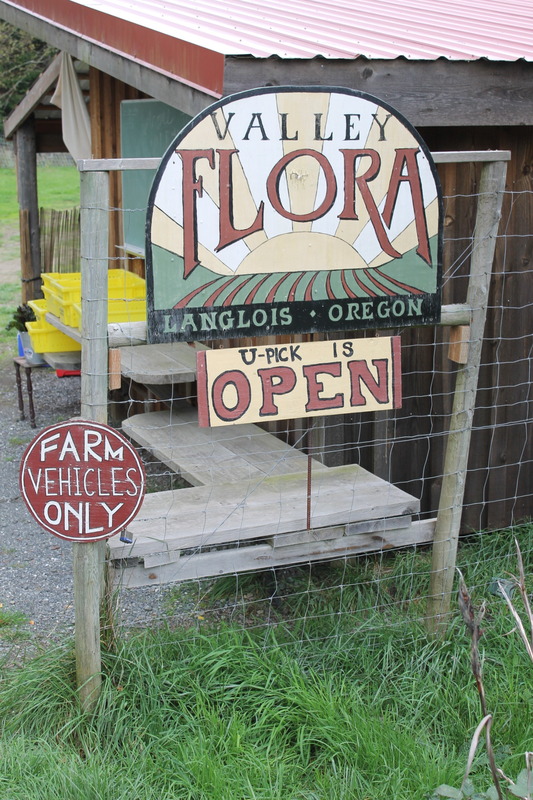 Tucked into the Floras Creek Valley near the community of Langlois, about 14 miles south of Bandon is the 90 acre Valley Flora Farm run by Betsy Harrison and her two daughters Abby and Zoe. 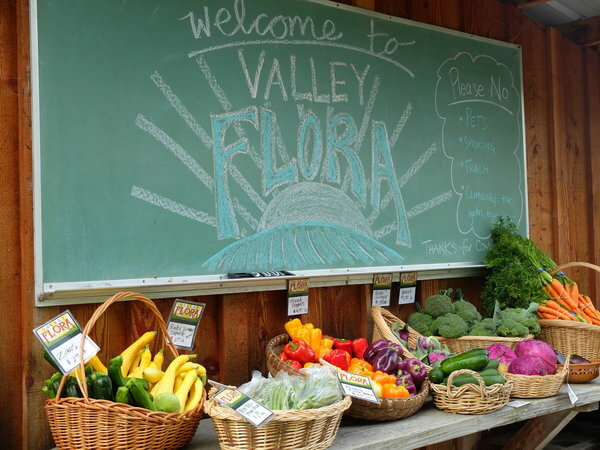 Valley Flora is a diversified family farm growing a huge variety of more than 100 fruits, vegetables and berries sold to individuals, stores and restaurants in many towns on the South Coast. Valley Flora is a collection of three different businesses run by the three women in the family, affectionately known as “The Florettes” or “The Dirt Divas”. The greenhouse expert, Betsy grows tomatoes, basil, peppers and cucumbers. She moved to Floras Creek in the early 1970s where Abby and Zoe were born and raised. When Abby finished college, she returned to the farm and started a salad greens business she called Abby’s Greens. Known as the “Greens Queen”, Abby has a loyal customer base including restaurants, stores and individuals in the area. When Zoe joined, she added berries, flowers, asparagus, artichokes and other annual crops to the mix, along with experience working as a crew manager at Sauvie Island Organics, a well-established organic farm in the Portland area. The Florettes are intentional about their farming practices and are dedicated to keeping the farm, the soil, the produce, and the consumers as healthy as possible. Committed to ecological practices, they farm without synthetic fertilizers and sprays, choosing instead to use compost and crop rotation. 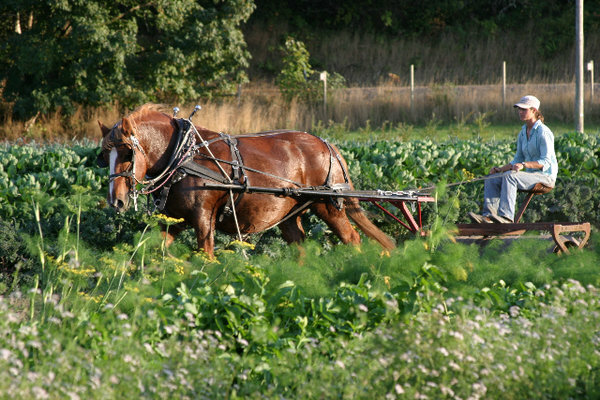 They do most of their work by hand, with occasional help from a tractor and a draft horse who goes where the tractor cannot. 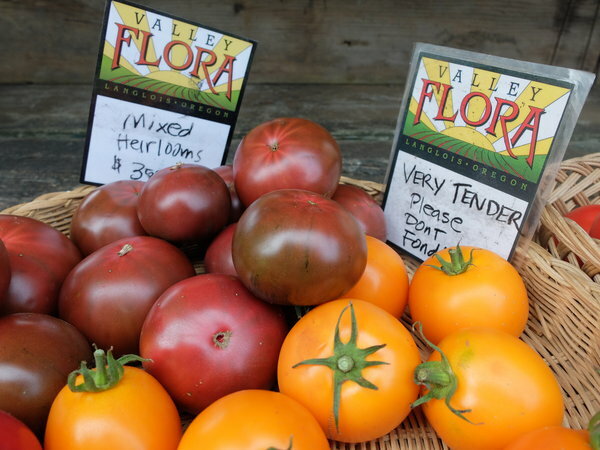 People in the area can find Valley Flora’s delicious produce in many restaurants and grocery stores, but many people choose to purchase the farm’s fresh produce from them directly through Community Supported Agriculture (CSA) shares, from the farmstand, or through the U-pick option. 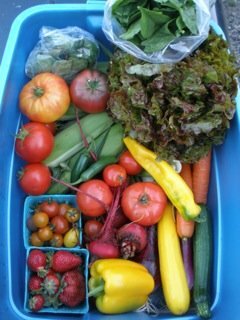 CSA members get a weekly share of whatever is currently in season and pick up their share in either Bandon, Port Orford, Coos Bay or at the farm itself. The CSA is so popular that there is currently a waiting list to join! If they desire, members can add a share of Carnahan’s Eggs, Abby’s Greens, and/or Juana’s Homemade Tamales to their farm shares. Click here to learn more about the benefits of Community Supported Agriculture. The farmstand requires no membership. The days and hours vary according to the season, but the quality of produce available never wavers. In the spring, the selection features artichokes and asparagus and can include greens as well as other things that come into season. The summer is bursting with a huge variety of delicious things that are far too numerous to list, but include berries, squash, tomatoes, and corn. The farmstand stays open into December with greens, squash, brassicas, and more. Shoppers can also often find Candace’s Eggs available at the farmstand. Regardless of the season, you’re well advised to stop by early as they often run out of produce before closing time! Some wish to get their produce and some time in the sun by taking advantage of the U-pick option and experience a little bit of farming first-hand. Depending on the season, pickers can go to the farm itself and pick their own flowers, strawberries, raspberries, marionberries and tayberries (an interesting cross between blackberries and raspberries). Bring your own containers and a hat and take home some of the finest produce around. For more information on this outstanding farm, its practices, products, and more, visit Valley Flora Farm’s website, and be sure to stop by the farmstand or the U-pick to experience it firsthand!